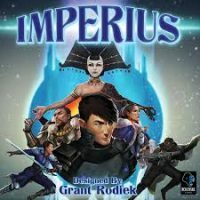 Imperius, from acclaimed designer Grant Rodiek, builds on the existing mechanisms of Solstice: Fall of Empire by adding asymmetrical factions, less secret information & varied planet effects that can grant additional special abilities to players. The world is brought vividly to life by the talented team at Gong Studios. The ruling house of the empire is in decline & in their weakness an opportunity presents itself. The throne is within the grasp of any rival faction bold & cunning enough to grab power for themselves. However, this is a nuanced conflict, one in which diplomacy cuts just as sharply as the weapons of an army, but only half as sharp as the assassin’s blade. There are wheels within wheels & machinations beyond your view. In Imperius, players represent powerful houses, each seeking to ascend to the throne. Every player has the same six cards, which provide strength, favor, victory points & bonuses. Unfortunately, the path forward is shrouded in fog, forcing players to manage the uncertainty of the times. Every round, players draft a hand of cards, choosing a mix of their cards, their opponents’ & powerful events. The key is building a viable strategy with your own cards & events while denying key cards to your opponents. Then, cards are played to the planets, with no more than two of these cards per planet being played face down. Players are forced to make decisions with imperfect information gained during the draft & by reading your opponents. Finally, the cards are revealed & resolved. In most cases, players want to be the strongest or most favored faction to score victory points. Add a Review for "Imperius"